I will, but just at the moment I'm working on code related to my 3D IFS formula - I did the other renders while coding and I haven't expanded the optimised delta DE formula to do shadows or positional lighting yet (that's next on my list, along with moving the rendering into the loop section instead of the global section so that *very* large renders are possible). I'm just rendering a full-view of the degree 7 version in green at 3000*3000, but still just diffuse lighting. I would like to make an animation of the higher power variation of Twinbee's Mandelbrot set, by continuously varying the exponent, but my code is pretty slow. It will take a while for me to complete the render. Perhaps David can render it faster than I could. It seems like his algorithm is quite fast. I haven't uploaded the 3000*3000 render of the whole object as I was disappointed with the result - it most definitely needs better lighting than plain remote diffuse from the viewpoint direction Also I think I overdid the delta DE threshold (at 1e-4) I may try again using say 5e-4. 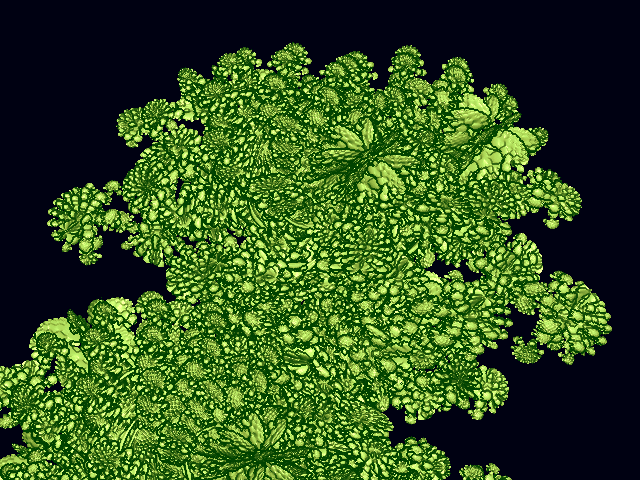 Wow, it really is beginning to resemble romanesco broccoli, even taking on the IFS look, but of course with a completely different approach. Can you make the Delta DE threshold lower still (lower = more fine detail right?). I'd love to see even more nooks and crannies... Any chance of 1e-7 or even 1e-8? Love to see the 3000x3000 1e-4 pic still if you can upload it. Even if it's 'overdone', that may be because of the plain lighting. It will still give an idea of what we can expect once shadows come into play (where I'm guessing no amount of detail can be too fine). This is really exciting - it's going to look so awesome with full shadowing etc. bugman, I like the sound of animating the exponent! David, this is astonishingly beautiful. 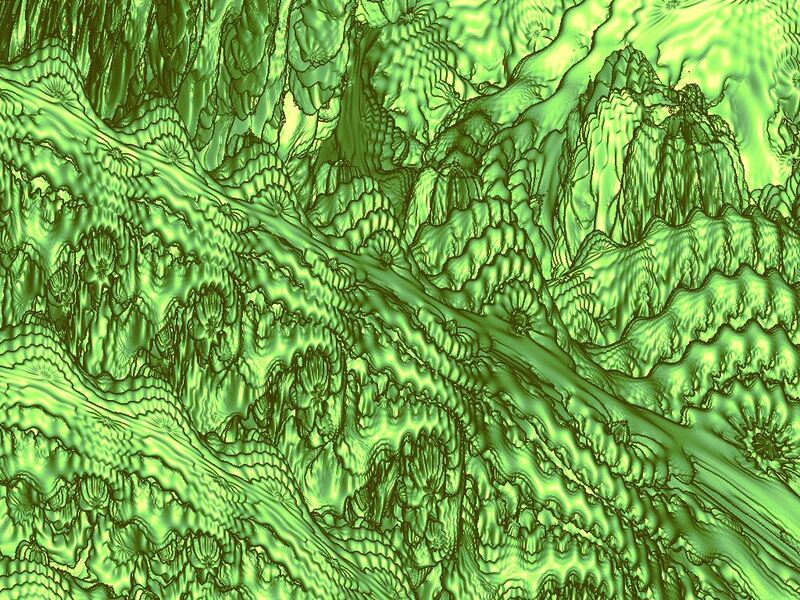 Yes, this high resolution fractal looks incredible. David, speed of your renderer is really impressive. I think I have to made second separate renderer for fast previews using DE and without rendering slices. Now I have to wait many hours to see any effect. Awesome indeed. Here's another taste of things to come. I took David's previous two images and superimposed them in a special way to imitate light sourcing/shadowing. The real thing should look much better of course! Edit: I updated the animation to a 640*480 version. Anyway rendering 500 frames at 640*480 took 4hrs 34mins, that's around 33 seconds per frame which I think is pretty good for my 2GHz core2Duo laptop in single threaded mode - note that because of the number of higher trig functions involved the core2Duo was actually less than twice as fast as this P4HT at rendering this one. How close to the holy grail is this gonna be - the one that I've always been hoping for?! The variety of the shapes is looking so promising! I wonder if the normal version (power 2) has this kind of detail at any point after zooming? Excellent shot David. You can guess what I'm going to say - I'd love to see a lower threshold for this one I feel we may be at the point Mandelbrot was when he first discovered the 2D version, but computers took hours or days to render anything. The animation is also stunning. It's like as if it's trying to subtly force more bulbs on the surface but without losing symmetry. I was thinking exactly the same - can't imagine how one might prove it apart from experimentally. I think it will be very interesting in 3D. Maybe somebody made some trials with 3D Buddhabrots? 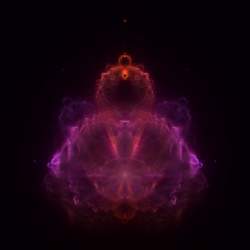 I'm planning in near future to write some program for rendering 3D Buddhabrots and animations.